The Pro Tour is firmly behind us. From this point we are dealing with the aftermath of the event and trying to determine what types of cards will be played most moving forward. Whether or not your speculations worked out this weekend (including whether your cards shipped – there were lots of problems with this happening, and the Twitter universe has made their displeasure known) it is good to plan ahead as a method for managing your Magic portfolio so that you maintain strong value. These cards are all hyped right now due to the finals being a mirror match of mono-blue devotion. Over the coming weeks, these cards will most likely decrease in price because players will find answers to the mono-blue strategy, building decks and sideboards accordingly. If you speculated on any of the above cards, you should try to sell or trade them soon. These are all cards that have reached what I believe is the critical price at which to trade or cash them out. They may increase in price down the line if they continue to see a lot of play across multiple deck archetypes, but the upside of selling them now outweighs the cost of waiting for that extra 10% of profit that may never appear. Nykthos, Shrine to Nyx saw a surge over the Pro Tour weekend because it combos really well with Green devotion for very fast mana. I don’t think it can go much higher than $15 because it is a rare (not mythic) legendary land. There is a cap on rare prices these days and Nykthos is pretty close to the ceiling, with $20 being the absolute most it could manage. Profits become more marginal on higher priced cards, so if you have Nykthos I would trade or sell them now because the price ceiling is not far away. Elspeth, Xenagos, and Boon Satyr made respectable appearances but didn’t really make any waves. I don’t really see them maintaining their current prices so I would feel comfortable trading them into longer term targets that have a better chance of holding value. 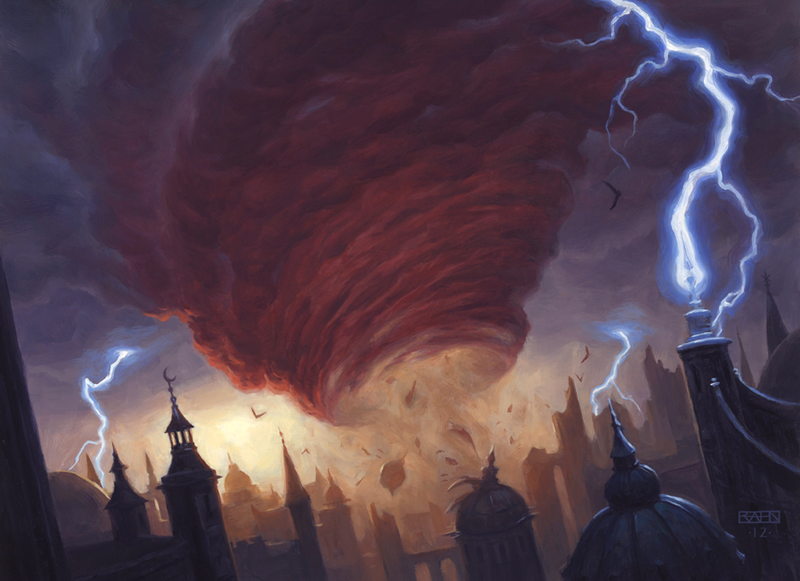 Now is also a good time to cash out on Return to Ravnica cards that you might have grabbed in anticipation of heavy play in the upcoming Theros standard. At the top of this list are Jace, Architect of Thought and Blood Baron of Vizkopa. They can easily be sold or buy listed for solid value. It will also be easy to trade these two into other cards that you might need for the future Standard. Ash Zealot and Detention Sphere have bumped up in price as well and I don’t think they can go much higher. Mono-red will fall out of favor during the upcoming months and Detention Sphere will be appearing twice in the Theros event deck, so it can’t climb much higher than it is now. Trade or sell these cards now before more players complete their playsets and demand dwindles. The cards below I believe are good to pick up whenever you can because having extras will only help you trade better as Theros Standard heads into winter. This is a card I haven’t considered until recently, but I believe that Domri has a lot of value to offer moving forward. Could this be the next $50 Standard mythic? It seems quite possible, as he is played as a three or four-of in many R/G and Naya Standard decks in addition to fringe Modern play. 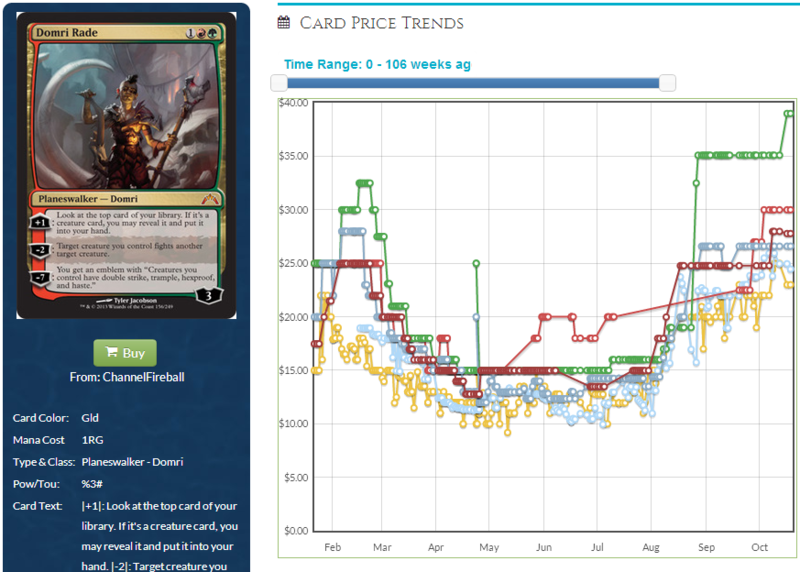 At $25 I am pretty comfortable trading for him, because as long as Domri continues to see heavy play, his price will match that demand. Scavenging Ooze kind of got cast to the wayside for a bit in the wake of all the mono-blue devotion decks, but this card still made a strong appearance in the decks that did play Green. It is also a popular card in Standard, being played in a least 25% of the decks in the format. It will be a strong Standard role player throughout its life in the format. If you have Scavenging Ooze, hold on to them for now because they will only increase in price as they get harder to find. M14 is going to be scarce by winter. Another format staple that has been quietly pervasive. Not only did this show up in the mono-blue devotion deck as a three-of, but many decks played four copies. Like Scavenging Ooze, as M14 becomes harder to find Mutavault will increase in price to match the demand. Thoughtseize is another format staple that was lost in the excitement of the weekend. This card is very closely approaching the $15 buy-in point that a lot of people are waiting on. If you look hard enough, you can find copies that are currently hovering close to $16 on some sites. I think that it is very close to the time to start going in big on Thoughtseize. At one point this card was $70 because of the heavy play that it sees in Modern and Legacy. You cannot go wrong picking up Thoughtseize in the near future because like Mutavault and Scavenging Ooze, it only has one direction to go. Similar to Thoughtseize, the time to start picking up the Scry lands is soon approaching. In the wave of all the Devotion madness the dual lands of Theros have been sitting on the sidelines. I believe that the scry lands will start seeing more play moving forward because people are going to try and tweak their Devotion decks to include splash colors. The three-color goodstuff decks will also continue to exist, and will need their color fixing as well. I want to talk about a few “wildcards” and their potential. These cards could be sleeper hits that see a significant price increase if the Standard metagame adopts them as tools that can be used in the new format. Skylasher could see a surprising amount of play moving forward, and at $0.30 this makes my speculator senses tingle. Last season, Skylasher was a bit too late to the party to properly deal with Delver of Secrets. At the time it was printed, the Delver decks had fallen out of favor, and instead people were playing powerhouse Flash decks that utilized Sphinx’s Revelation, or Bant Hexproof decks that consisted of creatures with flying, unblockability, trample, or a combination thereof. Now that mono-blue is back in Standard, Skylasher could come out of the woodwork as a way to deal with the mono-blue devotion decks. I like this spec better than Mistcutter Hydra because even though Mistcutter could also see play, Skylasher has a better chance of increasing in price as Dragon’s Maze wasn’t opened much and Mistcutter Hyrdra will continue to be opened for quite a while longer. I’ve always liked Cyclonic Rift as a speculation target. At the very least it is a great casual card that will see a lot of play in Commander, as it is one of the best blue sweepers in the format. However, it has been getting a lot of press in Standard recently because of mono-blue. I think that it could have a life outside of this deck as well. It could definitely find a home in future ramp strategies. For example, with a Prophet of Kruphix you can tap out for large spells on your turn and then on your opponents turn cast an overloaded Rift. Speaking of which, Prophet of Kruphix is another great speculation target because it is currently hovering around $1.50 and I don’t think it can go much lower. This is another card that could have Standard applications in addition to being a popular casual card that will see play in Commander for years to come. This is a card that I mentioned in my Theros review, and since then he has appeared in a Top 8 Pro Tour list as a three-of in the Japanese colossal Gruul deck. I get a feeling that we will be seeing much more of this card in the future. A 6/6 by turn 4 or 5 that ramps Nykthos pretty hard is quite threatening. Reach, the capability to destroy a flying creature, and becoming a 9/9 are just icing on the giant cake. I think that this could be one of the better payout speculation targets of my riskier picks moving forward. I had to double check myself that this card is really below $2 on a lot of websites. I remember when this card was released it was difficult to find them for less than $7. The effect on this card is really powerful, but previous control shells opted to use other tools that were better at providing incremental advantage. Even though a control player would never play more than 3 of these in a deck, I don’t think that this card could go much lower in price than it currently is. I think there is definitely enough time for this card to see more Standard play and rise in value.